Seafarers on long journeys were faced with dried biscuits that got soggy and moldy on leaky ships. Beetles and wormy weevils made homes in them. Cheese attracted flies and maggots; so much so that sailors joked that the cheese could walk off on its own. Even though meat was stored in saltwater barrels, it too, rotted. Vasco da Gama, an explorer, sailed from Portugal to India in 1497 with 170 men. Two years later, after the disease scurvy ravaged his men, he returned with a crew of 54. This scourge did not go unnoticed by the military. Feeding armies became an impossible problem. In 1795, the French government took action. A prize of 12,000 francs would be awarded to the inventor of the best-preserved food. That was a lot of money at that time and a French chef named Nicholas Appert took up the challenge. Even though he had no formal education or training in chemistry, Appert combined his experience as a candy maker, vintner (wine), brewer, (beer) and pickle maker. After 15 years of experiments, he successfully preserved food. The inventor/cook filled glass bottles with vegetables and closed then with cork stoppers—next, he immersed them in boiling water. He figured out that, similar to wine production, the introduction of air spoiled food. In 1810, the French Emperor gave Appert his prize. La Maison Appert, in the town of Massy, near Paris, became the first food-bottling factory in the world, years before Louis Pasteur proved that heat killed bacteria. That process called appertization, and his book, The Art of Preserving All Kinds of Animal and Vegetable Substances for Several Years, made its way around the world. In the early 1800s, three men –Peter Durant, William Underwood and Thomas Kensett– took the Appert idea and ran with it. Durant’s key improvement was moving from glass vessels to fashioning containers out of tinplate. For this, he secured a patent. His method was using round iron canisters coated in tin, to prevent rust and corrosion. Rumor had it that Durant founded his technique on the advice of a friend, Philippe Henri de Girard, a French engineer who is the uncredited inventor of food preservation involving tin cans. In Boston, Massachusetts, William Underwood used glass packing for condiments such as mustard, ketchup, and pickled vegetables but is most well known for switching to cans and the introduction of Underwood Ham. Thomas Kensett went to the United States and got a patent in 1825, then set up shop on the New York waterfront to can sealed fruits, vegetables, oysters and meat. His business took off. The demand for cans kicked up with the American Civil War in 1861. In the early 1600s, a prince known as the “Father of Modern Warfare," Gustavus Adolphus of Sweden used innovative battlefield tactics. His armies were highly trained and his techniques would be copied by many future rulers such as Napoleon Bonaparte, Arthur Wellesley the First Duke of Wellington, Carl von Clausewitz, a Prussian General and military thinker and General George Patton, organizer of the tank school in Bourg, France, who trained the first 500 American tankers. Gustavus knew two important things: that integrating infantry, cavalry and artillery into combined formations was logical; and that speed was integral in battle because loading soldier’s weapons had previously been slow and wasteful. He directed his troops to carry prepared cartridges made of a cylinder of paper (the word cartridge stems from the Latin charta, meaning paper). The cartridges held powder and ball and were twisted at both ends. Although this idea was adopted in America and Europe too, for the next two centuries cartridge development was stagnant. That began to change around the first decade or so of the nineteenth century with the advent of the metal-canning industry. Around the time of Appert’s bottling food success and prize, in Paris in 1802, Samuel Pauly (originally a Swiss) was awarded a patent for an innovative breech-loader for a weapon. His invention did not use external flintlock ignition as before, but instead applied a hammer cocked on a firing pin, or, an internal striker. When the shooter cocked the hammer and pulled the trigger, the striker hit the cartridge’s base rim and the ensuing explosion sent the bullet on its way. The modern safety pin came from inventor and brainchild Walter Hunt, a mechanic who had invented the lockstitch sewing machine. Unfortunately, Hunt was a kind man and when his daughter suggested his invention would put women out of work, he dropped the idea. Because his mind was prolific, he thought-up a machine to spin flax, a saw for forestry, a stove and the safety pin. He also came up with the fountain pen, a streetcar bell, paper shirt collars, hob nails for boots, bottle-stoppers, a lamp that didn’t explode, and his “Antipodean Apparatus"—a pair of shoes that allowed a person to walk on a ceiling, head-downward, a popular item with circus performers. The safety pin has a story too: Hunt owed a debt of $15.00 and was trying to think of a new invention. He took one piece of wire, coiled it at one end to make a spring, at the other a clasp and was able to force the wire into the clasp. The spring and clasp system gave him U.S. Patent #6281, but he sold it for four hundred dollars to pay back his friend. In a confluence of what Carl Jung would later call, “synchronicity," the next crucial stages occurred. The concept of the metallic cartridge, Pauly’s idea and rapid fire were linked by our old friend, Walter Hunt. 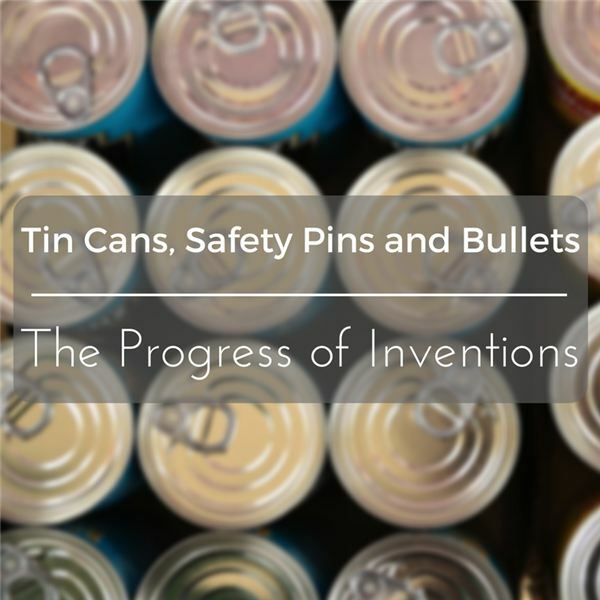 Food preservation (canning) beget the cartridge-slash-bullet, and the safety pin inventor made the repeating gun, all do have something in common. Carl Jung, a great psychologist, popularized an idea called the “Collective Unconscious," a notion that knowledge and wisdom are thoughts available to all humankind, a veritable universal library of knowledge in the ether available for plucking. What do you think? Les and Beryl Lailey opened a can of chicken 50 years after receiving it as a wedding present and it still tasted fine. If properly prepared and sealed, canned food will surpass its use-by date, apparently a long time! Kindersley, Dorling et al. Ideas That Changed the World. London: Dorling Kindersley, 2010. Book. Jango-Cohen, Judith. The History of Food. Minneapolis: Twenty-First Century Books, 2006. Book. Rose, Alexander. American Rifle: A Biography. New York: Delacourt Press, 2008. Book.